Brazil’s president-elect Jair Bolsonaro has confirmed he intends to defy the Palestinians and most of the world by moving his country’s embassy from Tel Aviv to Jerusalem. “As previously stated during our campaign, we intend to transfer the Brazilian Embassy from Tel-Aviv to Jerusalem,” Bolsonaro said in a Facebook post on Thursday. “Israel is a sovereign state and we shall duly respect that,” the post stated. 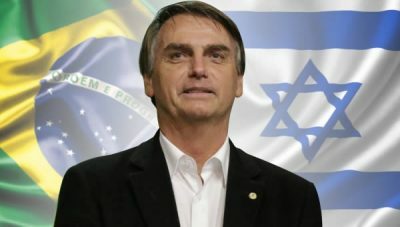 In an interview with Israel Hayom newspaper published earlier in the day, Bolsonaro said Israel should decide where its capital is located. “When I was asked during the campaign if I’d do it when I became president, I said, ‘Yes, the one who decides on the capital of Israel is you, not other nations’,” he told the newspaper, which firmly supports Netanyahu. Jerusalem’s status has long been a point of contention in the Israeli-Palestinian conflict. The Palestinian Authority wants occupied East Jerusalem to be the capital of any future Palestinian state, but Israel wants the whole city as its capital. The issue has been considered one that would be decided by Israelis and Palestinians in a final status agreement, but the US’s decision to recognise the city as Israel’s capital last December broke with that tradition. Israel occupied East Jerusalem in the 1967 Middle East war and later annexed it in a move never recognised by the international community. The embassy was officially transferred on 14 May, amid major protests in Gaza that Israel met with violent force, killing 61 Palestinians. Guatemala and Paraguay followed the US move soon after, though the latter announced last month it would return its embassy to Tel Aviv. Far-right politician Bolsonaro, 63, who won a run-off election on Sunday, has outraged many with his overtly misogynistic, homophobic and racist rhetoric. Following his election, the former army captain was congratulated by Netanyahu, who invited him to Israel. “I am confident that your election will lead to a great friendship between the two peoples and to the strengthening of ties between Brazil and Israel,” Netanyahu told Bolsonaro, according to a statement from the prime minister’s office. “We await your visit to Israel,” Netanyahu said. The first Israeli official to congratulate Bolsonaro was Knesset Speaker Yuli Edelstein. “Warm greetings to my friend Jair Bolsonaro for his election to the presidency of Brazil,” he said in a statement on Monday. Israel’s economy minister, Eli Cohen, also welcomed the result, adding that he expected greater economic cooperation between the two countries. In a statement in support of Bolsorano, Cohen said the president-elect would “usher in a new era of political and economic tries with the the largest country in South America”. Featured image is from The Yeshiva World.